Sorghum is grown in California as a high yielding, drought resistant, low input forage and grain crop. However, it's been bugged lately. 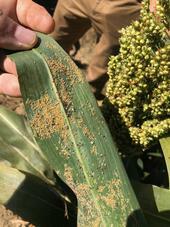 Last month, a sorghum field in Yolo County and fields throughout the Central Valley were infested with sugarcane aphid. This infestation came in relatively late in the Sacramento Valley. As comedian Rodney Dangerfield used to say: “I don't get no respect”! Forgive the double negative, but farmers and supporters of our lowly alfalfa and grass crops seem like they have the same complaint. Over 2/3 of all agricultural land in the US is grassland with an economic value of $44 billion/year (2008, Sanderson et al., 2012).